OUABI ROUIS CROWNED AS SGTF PREMIER LEAGUE CHAMPION 2014 !!! … GIOVANNI CHONG WINS THE JUNIOR LEAGUE TITLE !!! The final matchday of the SG Table Football Premier League and Junior League took place at the Sports Hub Library on 16 Nov 2014. Many games were played while unplayed games at the end of the day were decided based on attendance as per League Announcement dated 11 Feb 2014. For Ouabi Rouis, this is his first League campaign on Singapore soil and what a rec0rd-breaking season he had. On his way to the title, he chalked up a record 87 points and scored a record 125 goals!! Nearest challengers Den Mulia Yusni (the defending 2013 Premier League Champion) and Rudy Hesty Roselan (our star of the 2014 Rochefort World Cup) were both a good 18 points behind Ouabi. Both Den and Rudy were tied on points with Den having the edge with a better goal difference. In 4th place, is our friend from Hong Kong, Antonio Carabillo, a further 13 points behind. For Giovanni Chong, it was no surpise that he won the Junior League comfortably; as he is clearly heads-and-shoulders above the rest of the field. He also made history by completing the season unbeaten!! Likewise, he had a comfortable 14-point lead over 2nd place Chihiro Takao. 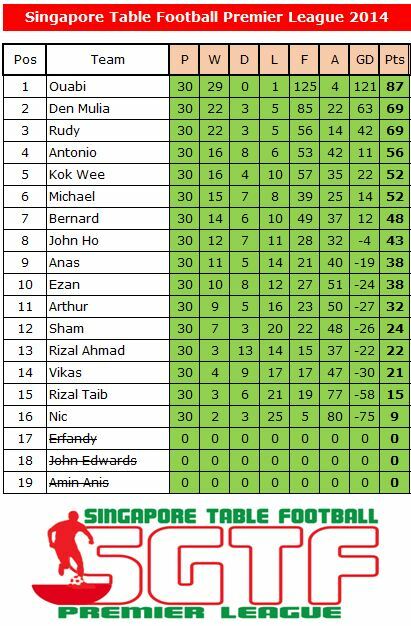 2 points further behind was Isaac Lim and Asyraf Rizal who were tied on 46 points with Isaac edging out Asyraf for 3rd place on goal difference!! 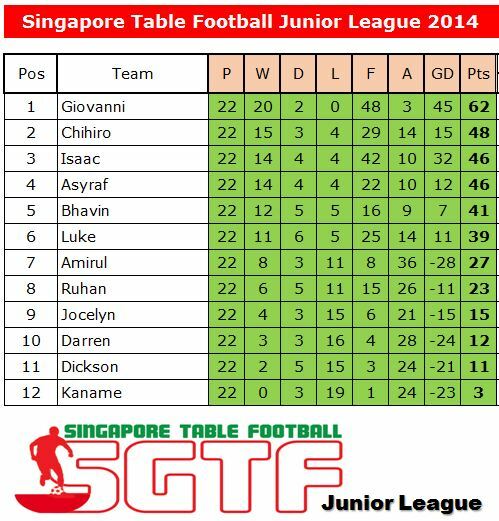 Well done to all players participating in the SG Table Football League 2014!!! … next season’s SG Table Football League 2015 promises to be better and more exciting!! … Watch this space! !